Rancho Santana is a world,class resort and residential community located on the Pacific coast of Nicaragua. It boasts 2,700 acres of rolling hills and two miles of rocky and dramatic shore, broken up by five distinct beaches nestled in their own hideaways. Make the Ranch your home, visit for a stellar vacation, or host a special event. Think You Can’t Afford Beachfront Property? You Can Now! Own Your Slice of Tropical Paradise. Tucked between the vast Pacific and immense Lake Nicaragua, Rancho Santana has the distinction of being one of the only isthmuses on the entire Pacific Ocean, which gives the Ranch nearly constant breezes. These breezes are an enjoyment all their own, but also create some of the world's most vertical waves, providing both visual drama as well as world-class surfing. Rancho Santana provides both resort amenities for vacationers and special group occasions as well as residential options for those seeking a second home in the sun and/or investing in emerging markets. 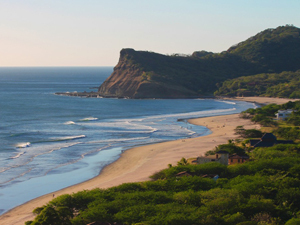 With the opening of The Inn, guests will delight in the unique variety of accommodations available throughout the ranch, each showcasing the rugged, natural beauty of Nicaragua's stunning Pacific coast. The residential component of the project is dispersed throughout the various neighborhoods of our property, which have been strategically plotted for maximum scenery and privacy. Rancho Santana's Puerta del Mar Villas combine luxury and comfort with convenience and affordability set against a backdrop of ocean and mountain views. Theres no easier way to enjoy Rancho Santana's lifestyle than ownership here. Residency includes access to concierge and valet service. All of the on-site amenities, including The Santana Beach Club & Spa, are a short walk away. Puerta del Mar Villas come in two luxury models, La Granada and El San Juan, which range from 1,500 to 1,700+ square feet in size. The Estates represents a new level of luxurious living. Every homesite in The Estates provides residents with commanding views of mountains, valleys and the Pacific Ocean. Situated along the highest ridge of Rancho Santana, this exclusive community features lots of one to three acres and bordered by green preserve, enhancing your privacy and affording a prime habitat for Nicaraguas exotic surroundings. The large lots in The Estates assure youll have plenty of space for large estate homes, guest quarters, and swimming pools. Atop the hills overlooking Playa Santana and Playa Rosada–two of Rancho Santanas five pristine beaches sit The Ranchettes. This exclusive development of fourteen spacious lots provide priceless views of the Pacific and the best of the oceans breezes. Each Ranchette homesite covers 710 acres and is surrounded by rich pastures and woodlands. Although the Ranchettes are secluded, Rancho Santana's many amenities are just a short distance away. 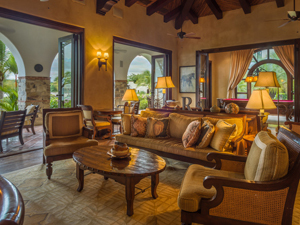 The Ranchettes afford a peaceful life surrounded by the natural beauty of Rancho Santana. Bella Vista (beautiful view) features a community of more than 60 homesites. These lots range in size from just less than an acre to nearly three acres, large enough to build a house with swimming pool and plenty of lush greenery to ensure privacy. Rancho Santana's amenities are just a short drive away. Enjoy a day of swimming at Playa Escondida, head over to Santana Beach for world-class surfing, hike the nature trails, or saddle up the horses and ride along the coastline. There's something for every taste at Rancho Santana's beautiful Bella Vista community. Located on 1,000 acres of undisturbed land is a community of more than 50 private estates known as Rancho Los Perros. The homesites are relatively larger than most lots at Rancho Santana and all with breathtaking views of the mountainous coast line, valley or the Pacific Ocean. The gentle breaks at Playa Los Perros make it an ideal beach for swimming. Los Perros is fully equipped with water, drainage and underground electrical systems. Every effort has been made to make the utilitarian aspects of the community disappear in order to preserve the natural vistas. The Alta Vista subdivision runs along a ridge overlooking Playa Escondida. It's the highest point on the entire property and these homesites provide owners with some of the best views of the Pacific Ocean and the mountains of Costa Rica. Just a short drive away, all the amenities of Rancho Santana await. Your day may include a horseback ride along the beach or an afternoon exploring the abundance of green space along the nature trails. Rancho Santana’s beaches offer surfers everything from soft swells to challenging breaks that consistently exceed five feet. The Casitas are a picturesque village of 21 two-bedroom villas beautifully landscaped with tropical flora, and are fully furnished with all the necessities for convenient ownership. U.S. standard appliances include air conditioning, refridgerator and satellite television; bedrooms and living areas fitted with exquisite hand-crafted furnishings; even soft goods are available. A casita provides a turnkey investment as well as comfort and convenience for visiting and living. Each unit is conveniently located near the main clubhouse, beach and all amenities. The Ranch boasts two Clubhouses that each have their own pools and are reserved for the exclusive use of owners and guests. There are a variety of dining options as well, from farm-to-table fine dining at La Finca y el Mar to casual & traditional beach fare at The Beach & Surf Club at Playa Los Perros. There is also a conference center and boardroom (Sala Pacifica) for various uses. The main restaurant, La Finca y el Mar, serves fresh food from the organic farm and local fishermen. The menus cater to a variety of American tastes, serving everything from a gouda burger with yucca fries to an omelet with kale, barbecue pork ribs to butternut squash arancini. A Belgian baker is in-house to make pastries and ice cream, and Mexican chef Jorge Alvarez—who founded the popular Los Tacos No. 1 in New York—is re-creating Baja beach food at a new beach and surf club on the development's most remote beach. Enjoy the intimate elegance of the dining room, or dine alfresco on the patio overlooking Santana Beach. Indulge in fine wines, good food and first-class service in an intimate atmosphere. Be sure to catch Rancho Santana's famous sunsets. Located on our southernmost beach, The Beach & Surf Club at Playa Los Perros is home to another dining venue at the ranch, La Taqueria. You'll find a simple, fresh menu featuring items like fish tostadas and spicy pork tacos with fresh lime, cilantro and a variety of homemade salsas. A rotating selection of local beverages, including fresh fruit juices, buckets of beer and classic rum and tequila cocktails is also available. 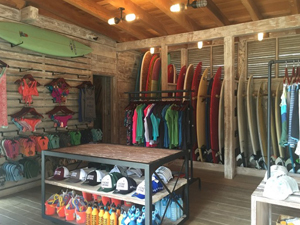 The Beach & Surf Club is also a convenient one-stop shop for all your 'day at the beach' essentials, from bathing suits and rashguards to fins, wax and surfboard rentals. Surf at Rancho Santana. The steady offshore breezes—courtesy of nearby Lake Nicaragua and the Caribbean Sea—combine with perfectly angled coastline to turn Pacific swells into world-class surf conditions almost 330 days out of the year. The southwest coast of Nicaragua is renowned for having some of the best uncrowded surf breaks in Central America; three of which are on the beaches of Rancho Santana. The year-round off shore breezes met by consistent swells create some spectacular waves not to be missed. Let our local guides take you to the right place at the right time in order to catch the best waves in the area. There are more than 10 different breaks within reach, whether by car or boat, ranging from fast hollow reef breaks to pumping beach breaks to massive outer reefs. The Ranch has its own grocery store and dry goods market, La Tienda. Here, you'll find just about everything you could possibly need (and want) during your vacation, from drinks and snacks to toiletries and unique gifts to take back home. If you love to cook, or would just like to have easy access to snacks and drinks at your casa, casita or villa, let Rancho Santana's grocery procurement team assist you in pre-stocking your rental. It is as easy as choosing what you would like from a list, we'll take it from there and you can expect a fully stocked home upon your arrival. There's no better way to experience the varied landscapes and unmatched beauty of Nicaragua's southern Pacific coast than on horseback. From sunset rides along the beach to cultural tours of local villages, we offer a variety of horseback riding adventures for all levels of riders, even beginners. The horses are responsive, strong, well trained, and many are gaited. Guests are matched up to the horses according to their riding experience and each ride is tailored to the interests and time frame of riders. Plus you'll find a spa, yoga and fitness center, nature preserve, kids club, Rancho Santana mill works, guided area tours, fishing charters, and much more! To satisfy the increased demand for high-end, beachfront accommodations near the Inn, we recently broke ground on what we believe will be the final "turn-key" residences available at Rancho Santana. Just steps from the shores of Playa Santana, The Residences have been designed to compliment The Inn by offering kitchen facilities, additional living space, and over-sized outdoor terraces for entertaining. The Residences will come fully furnished and ready to rent or live-in, emulating the same upscale, "rustic elegance" of The Inn and complete with high-end finishes and accents (fine art, custom linens, sheets, etc.). The neighborhood of Las Colinas is comprised of 14 lots, centrally located within the heart of Rancho Santana. The versatility is unmatched; in addition to offering incredible views of the Pacific coastline, Las Colinas is bordered on two sides by green space and a designated nature reserve. Las Colinas is our most well-planned subdivision, by far. These Developer lots are large ridge-line properties (1 acre +/-) that offer spectacular ocean and mountain views, while their shaded hilltop location ensures year-round coastal breezes and maximum privacy. Not only are we pleased to offer the opportunity to invest in one of the fastest-growing emerging real estate markets of the past decade, we're also offering a way to do it with borrowed money. With the credit markets as tight as they are today, this is a rare opportunity. Rancho Santana's Building Services Program (BSP) has been designed to make building ones' dream home easy and stress-free. BSP provides turn-key Design/Build Management services. We manage every step of the process, from architectural planning and engineering, to bid solicitation and contractor selection, to project administration and finishes selection, to quality assurance and testing through the course of construction. Owners can rest assured that their home is properly designed and constructed. The Inn at Rancho Santana makes a particularly picturesque corner of the country's Pacific coast accessible to couples or others who want to stay in high-luxury, local-feeling surroundings, without renting one of the larger accommodations. The inn, which is adjacent to the community's clubhouse and flagship restaurant, contains 17 individually decorated rooms and suites (from $249), designed in a rugged but romantic style. Although the building is new, it has the feel of an old hacienda, with all the rooms opening around a central courtyard, and virtually everything on display made by local artisans or even in house, in Rancho Santana's iron works and wood shop. The Puerta del Mar villas sit in front of the beautiful beach known as Playa Santana; the favorite surfing, swimming and fishing destination for residents and guests. From your villa you can view a magnificent sunset ... or settle down on one of the beaches, each with its own special character. From the wild beauty of Playa Santana ...to the pink sands of Playa Rosada ... to the private feel of the hidden Playa Escondida, there's sure to be a beach that feels just right for your mood. All of the Puerta del Mar villas have beautiful ocean views, and they enjoy one of the world's most-magnificent sunsets. These brand new units are available with either two or three bedrooms (each with two baths), in sizes of 1585 and 1726 square feet. Every owner is entitled to enjoy all of the amenities, facilities and benefits that Rancho Santana offers.